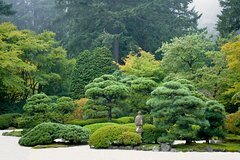 For more than 50 years, Portland Japanese Garden has been a haven of serenity and tranquility, nestled in Portland’s Washington Park. The Garden is composed of eight unique garden spaces. From the lush greens of the Strolling Pond Garden to the spare empty space of the Sand and Stone Garden, each style demonstrates unique aspects of Japanese garden history and design. In 2017 a Cultural Village, designed by world-renowned architect Kengo Kuma, added more room for education and exploration. With frequent exhibitions and demonstrations and an authentic Japanese style tea café, Portland Japanese Garden aims to expose our visitors to the best of Japanese culture. Stroll around, slow down, and let your senses guide you into another world. In Japanese gardens, everything you see is intentional. Consider this along your stroll through Portland Japanese Garden’s 12 acres. Notice each plant and stone’s placement and how the paths change and guide your experience. A Japanese garden isn’t meant to evoke strong emotions, but rather quiet reflection. Designed with plants that naturally mark the passage of the seasons, Portland Japanese Garden is beautiful throughout the year. Spring brings new blooms that gradually fade into the summer’s tapestry of greens. Autumn sets the Garden ablaze, while winter reveals its stunning bones. The recent expansion added a modern Cultural Village just outside the historical Garden’s gates. Home to three buildings and several new Garden spaces, including a Bonsai Terrace, the expansion has added much to the attraction’s offerings. The Umami Café offers an array of authentic tea and light snacks for you to enjoy while reflecting on your experience. Art exhibitions and cultural demonstrations occur throughout the year and provide cultural context for the Garden.